The Bad News Bears had enough potential to get me into the screening room. It’s directed by Richard Linklater (School of Rock), no slacker when it comes to hip movies, and it features Billy Bob Thornton mixing his role from Bad Santa with his role from Friday Night Lights. Ordinarily I’d be wary of a remake of a movie from my own childhood, but I decided to trust Linklater and Thornton. “Big mistake,” is what I was tempted to write next. But in fact, The Bad News Bears is a passable comedy. It fails to rise above medium-to-low expectations, but it’s not a huge mistake on the order of Herbie: Fully Loaded. Thornton plays Buttermaker (Walter Matthau played him in the original). Although he’s now an exterminator he’s also an ex-Mariner, which makes him a big star in this small California town. Some expository dialogue reveals that his team is made up of quota kids, kids whose parents had to sue to get them on the team. Most of them don’t seem too interested in baseball. Two don’t speak the language. One is a paraplegic. Buttermaker spends as much of his time drinking as possible. On the first day of practice he beans half of the batters and then passes out. For good measure, the little firebrand on the team steals the money from his wallet. But before long the whole sports-movie plot kicks in. The team starts improving, particularly when Thornton recruits an older girl, Amanda (Sammi Kane Kraft, played by Tatum O’Neal in the original), to pitch for them. And she, in turn, gets the “bad,” rebellious older boy (Jeffrey Davies) to join their team. Set up as the villains are the Yankees, led by the town’s Subaru dealer, Coach Bullock (Greg Kinnear). His team is the opposite of the rag-tag Bears. The Yankees are sponsored by a sporting goods store; the Bears by a strip joint. The Yankees practice good sportsmanship before and after every game; the Bears sulk or gloat, depending on how they did. We don’t know where the Yankees go when they win, but the Bears go to Hooters. The Bad News Bears starts strong. In my mind, I could hear my jock-y brother laughing for the first twenty minutes, and me along with him. But the humor Thornton and Linklater bring to the film is only used to set things up. In the end, the demands of the story win out and the funny, antisocial antics get benched. At that point, The Bad News Bears is just another remake. I can even pinpoint the moment the film changes from punk comedy to sports movie. The Bears all vote that they want to quit. That ought to be fine with Buttermaker, who couldn’t care less about these talentless brats. When he starts to give his motivational speech, I assumed he had some personal reason for making them stick it out, like a court order. But no, our heretofore bad Santa simply found his heart of gold. His change in heart is too abrupt and it happens too soon to be believable, and from that point on, the movie runs on autopilot. In the end, The Bad News Bears is a mediocre movie. It is funny in places, and I would selectively recommend it to some friends and family. 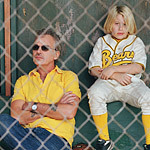 But even with lowered expectations and the talent of Thornton and Linklater, The Bad News Bears doesn’t quite make the cut.